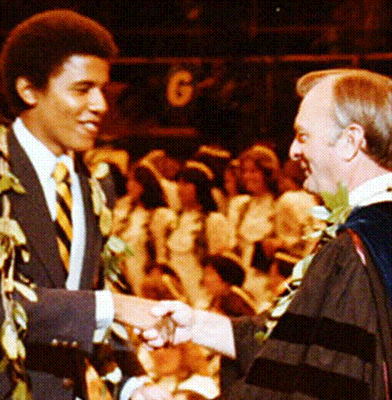 ﻿ Dee Finney's blog September 4, 2012 - page 285 OBAMA MOVING TO HAWAII? UNFORTUNATELY, YOU GET WHAT YOU ASK FOR!!! 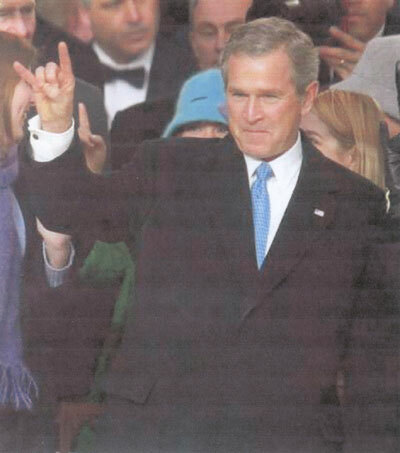 The secret hand signs of Illuminists are thought to work magic, to evoke supernatural beings, and, of course, to communicate messages. 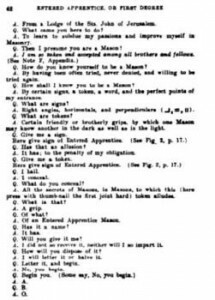 For example, the higher degree Mason, Rosicrucian, or other Illuminist can discern at what ritual level a brother in the Craft is ‘at by testing his handshake, or grip. It is, therefore, an important mode of recognition. The commonly used phrase, “Get a grip,” has Masonic origins. 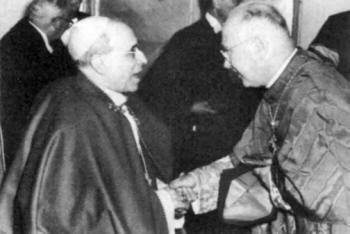 The handshake, or grip, is a sign of unity, oneness of purpose and allegiance or devotion to joint cause. It is considered a bond, or seal, of acknowledgment between Illuminist brethren. 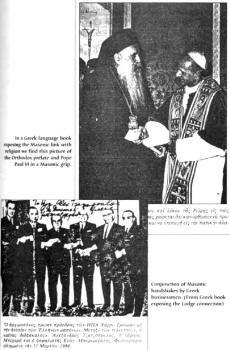 The Masonic authorities speak of a “mystic tie” or spiritual union. 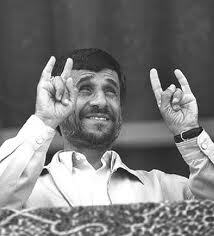 Certainly, demon powers do congregate together and enjoy one another’s foul company. The instructions issued the candidate of the Entered Apprentice, or First Degree, of Freemasonry include these given here. Moreover, the Mormon Church, the Sufi Muslim Brotherhood, and even the notorious Mafia have their own identifying handgrips and signs. 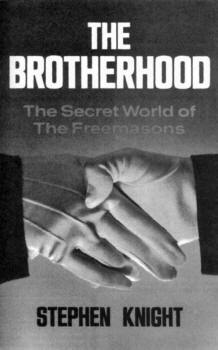 In the pages that follow in this chapter, you’ll see a large number of well-known persons sharing handgrips and handshakes that clearly are Masonic and Illuminist. I have done my best to take all these uncontrollable factors into consideration here and I include only what I believe to be indisputable Masonic and Illuminist handshakes, tokens, and grips. 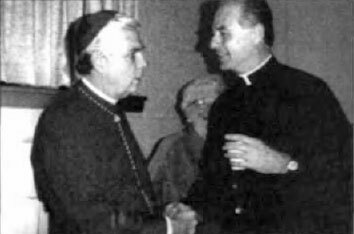 Naturally, one must especially consider who is shaking whose hand — and whether the person is known to be an Illuminist, a Mason, a Rosicrucian, an O.T.O. adept, or so forth. 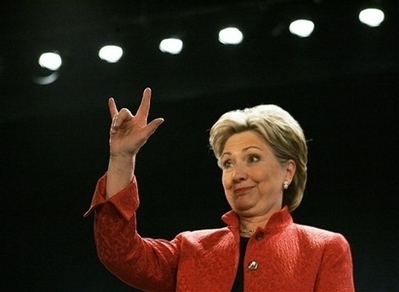 With these caveats in mind, let us take a look at the secret handshakes of the Illuminati. But first this brief article by Christopher Story. 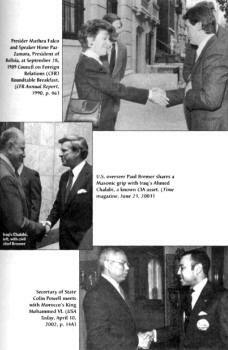 Handshake Diplomacy: An Outbreak of the “Grips” “They are out of the gate, and nothing will stop them.” This description, by one of the sharpest of our informants, with the hectic pace associated with the imposition of the New Underworld Order, sums up the way the world is being turned upside down “as we speak.” That’s why the press is publishing all these “grips.” And the newspaper editors have shown themselves to be only too willing to oblige. Let’s “get a grip” with what’s going on here. 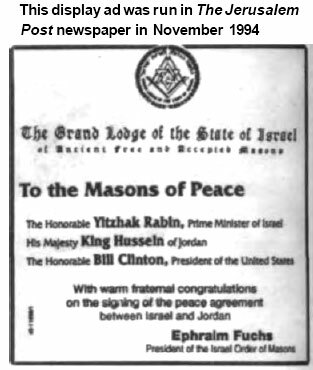 All of a sudden, newspapers on both sides of the Atlantic have taken to publishing large photos of our “chosen ones” indulging in various manifestations of Masonic “grips.” There was that Kerry-Clinton handshake published in The Washington Times in March. 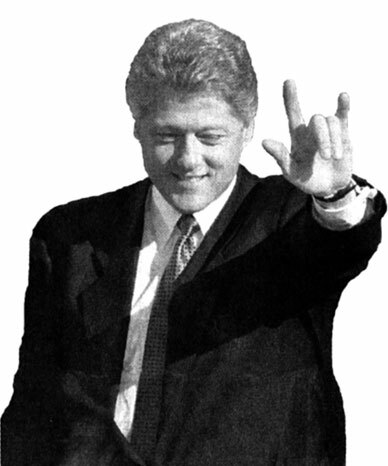 In that instance, Clinton was demonstrating, for those “in the know,” just who was boss, and how high up in the geomasonic stratosphere he is (right at the top). The “grip” in question was a Ma-Ha-Bone Lion’s Paw Grip, which leaves the junior party in no doubt who’s in charge (and in pain as a consequence). 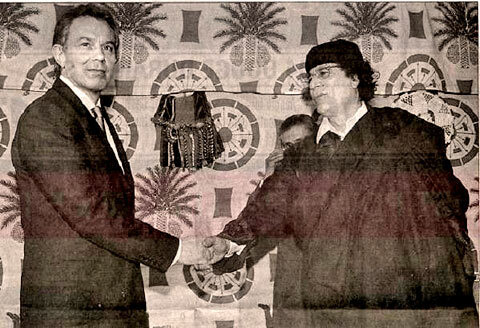 On 26th March, British newspapers carried an enormous picture of Tony Blair’s “grip moment” with Libyan dictator, Muammar Qadhaffi. Before proceeding, it needs to be said that these close-ups of Qadhaffi’s face reveal this man to be burdened with the most evil physiognomies on record —far nastier than those of Adolf Hitler and Saddam Hussein combined: in fact Saddam looks quite benevolent beside this creature. For his part, Blair looked extremely uneasy, his eyes watery, and his faced tensed up after what may have been some unspeakable encounter or other about which the record is silent (worse case scenario). 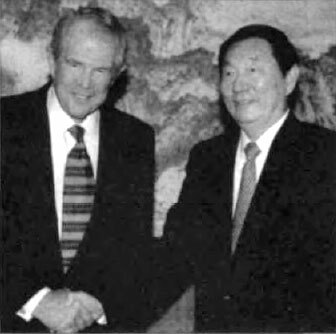 Beneath the main picture, The Times had taken the trouble to provide us with three smaller close-ups of the “grip moment”-the newspaper’s management being clearly signed up, in advance, to the significance of these New Underworld Order handshakes. 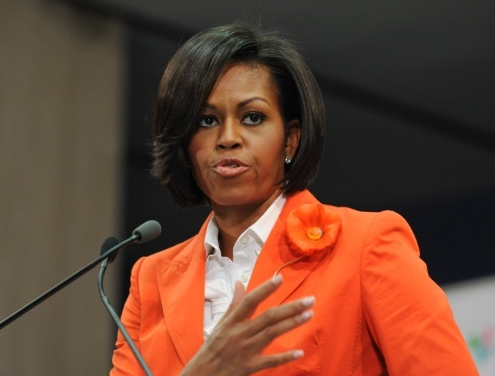 “Clearly he (Blair) has not read Emily Post, the doyenne of 20th Century etiquette. 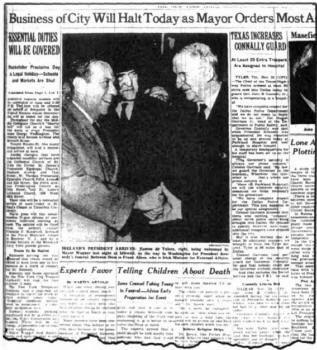 As reported in The New York Times, November 25, 1963, New York City’s Mayor Wagner welcomes Ireland’s President Eamon de Valera to the “Big Apple.” The Irish leader was at New York’s Idlewild Airport on his way to Washington, D.C. for the slain President John F. Kennedy’s funeral. Strangely, the smiling Mayor looks in high spirits, though most of America was in deep mourning. Oppenheimer, a Jewish cabalist, held the 33rd degree. Andrew Jackson (“Old Hickory”), the historical figure in the painting on the wall, was also a 33rd degree Mason. Oppenheimer lost his security clearance when it became clear to security officials that he was most likely a Communist espionage agent and certainly was a Communist sympathizer. 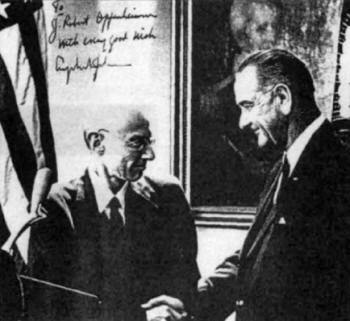 Both the Soviet Union and the nation of Israel were given secret plans to the atomic bomb weapon by Jewish spies burrowed deep inside the United States military science establishments. 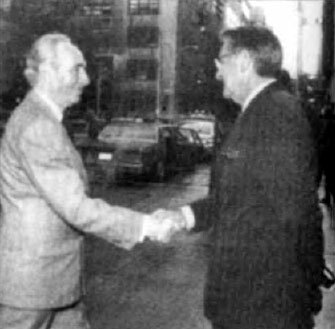 Freemason Shimon Peres, who was educated by Jesuits as a youth in Poland and was the Prime Minister of Israel and that nation’s Minister of Foreign Affairs, is being welcomed to the Council on Foreign Relations, based in New York’s Harold Pratt House, by its Chairman of the Board, fellow Illuminist, Peter G. Peterson. 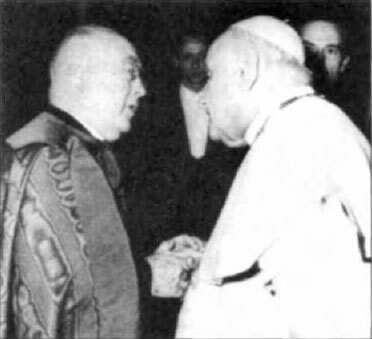 New York’s powerful Cardinal Spellman shakes hand of Pope John XXIII, who succeeded Pope Pius XII. FOR WHO HAS TALKED OF PLANET X EXCEPT THE ET ZETAS SINCE 1995 ? WHY AREN'T WE PAYING ATTENTION NOW? ELECTIONS TO BE SUSPENDED FOR THE 'NATIONAL EMERGENCY' ? overshadowing all political processes. Do people know, subconsciously, all governments are about to collapse? it on CSPAN because there are no commercials and no talking heads. community of Kailua, on Oahu. president, so he needs a home now, and absolutely plans to move into it by January. the Pacific Plate. Another is that the property faces the USA, not Asia, and thus might be spared the largest of the tidal onslaughts....REALLY? Obama inner circle, or just another home for the very wealthy, which all presidents have become? You cannot make this stuff up. Read the articles below. I enlarged the font where the political implications are mentioned. As Nancy Lieder pointed out to me, the extremely wealthy do not intend to let the common man know how bad the situation will develop. base in the Rockies, or, a submarine can take him to some other country. a little sloshing of the oceans....."
be open only 2 or 3 days a week, but the elite will do anything to convince you, right up until the last minutes, that you have nothing to fear. the secret US space program, never admitted. 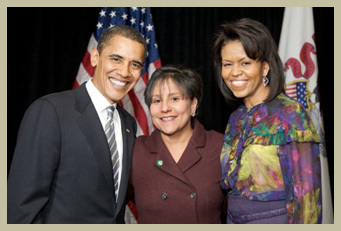 The woman who is organizing the funding of the Obama’s post-presidential estate is Penny Pritzker (pictured above, in between the worst President since Jimmy Carter and a woman who only dresses appropriately on Halloween or April Fool’s Day), who is also in charge of raising the donations for Obama’s presidential library and museum. The two are more or less the same project, with the priority being to get the $35 million together to fund the purchase of the Obamas’ new home. It appears that Pritzker herself may contribute up to half of the total purchase price, making up the difference from whatever the Obamas could not afford and the fundraising wouldn’t cover. Pritzker is a billionaire who in recent years resolved a long-standing family feud over her late father’s vast business empire that includes the Hyatt Hotel chain as well as assorted manufacturing operations. The wealthiest families in Chicago are being leaned on heavily to contribute with Penny aggressively guilting them with “appeals of you don’t want the President to be homeless in January, do you?”. That’s more or less an exact quote from Penny, if my source within her social group is not paraphrasing. Here’s how post-presidential homes typically work: the President’s friends and wealthiest supporters chip in to ensure the family leaving the White House has someplace “suitable” to occupy once they are no longer living at 1600 Pennsylvania Avenue. Another part of Penny’s fundraising push is that “the Obamas can’t go back to Hyde Park, it just wouldn’t look right, that house is too small and is not suitable for their new stature”. The Obamas are never going to live in Chicago again. They never planned to. But this election has gone south in ways they did not expect before Obama’s infamous “You didn’t build that” comment last month. 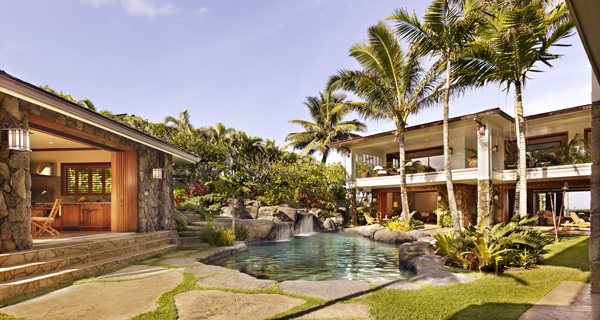 The plan was always to get them an estate in Hawaii, but it had been to buy them land and then construct a home especially for them. 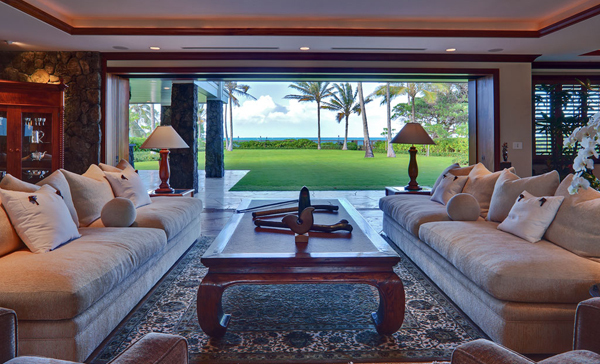 Now that there’s a rush to have something ready by January, the most opulent available home on Oahu must be secured for the Obamas “lest they be homeless” as Pritzker is arguing. Before that “you didn’t build that, somebody else made that happen” revelation, there was still a (delusional) belief in Obama’s inner circle that Democrats could pull off a win in this election. They also expected Mitt Romney to select Rob Portman or Tim Pawlenty as his VP…and the most delusional of them believed if Paul Ryan was in fact chosen that the Medicare attacks would sink him…and Romney’s campaign too. When it became quickly and resoundingly clear that Romney/Ryan was a winning combination, the emergency contingency protocols went into effect and Penny Pritzker started the aggressive fundraising push for the post-presidential purchase. When the media says “meteorite”…. think fireballs from Nibiru… the activity we are experiencing is much beyond any “normal” meteorite activity. Stay positive, God is totally in control here… notice no planes have been hit? Ask the angels to guide us safely through these times. Dieter Braun, the three images are photos taken by and posted by a member of the Earth Changes and Pole Shift website associated with Zetatalk. Without a doubt, Planet X is bombarding Earth with flaming fireballs from its debris tail, which, blown by the solar wind, billows directly toward Earth. Blazing hunks of junk from this tail are hurled at us with increasing regularity. Let’s take a look at flaming fireballs this week alone. On Tuesday, Oct. 16 around 7 p.m., several witnesses reported seeing a fireball streak across the sky in the Washington, D.C. area. It was red orange in color with a yellow-orange tail, and it lasted a bit longer than a shooting star. View slideshow: Ooops, we didn’t see it until it whizzed past! On Wednesday evening, Oct. 17 around 7:45 p.m., a gigantic fireball was seen in the skies over parts of Northern California and aloud boom was heard. Late on Monday night, Oct. 15, around 11:40 p.m. in Louisiana, the “granddaddy of fireballs” slammed to earth, exploding and gouging out a trench. Since that time the “heavy foot of the cover-up” has come down hard on the story, and conflicting and contradictory reports abound. San Francisco fireball: On Wednesday evening, Oct. 17, gigantic fireball seen in skies over parts of Northern California; a loud boom was heard. Video: Louisiana boom: Disinfo? 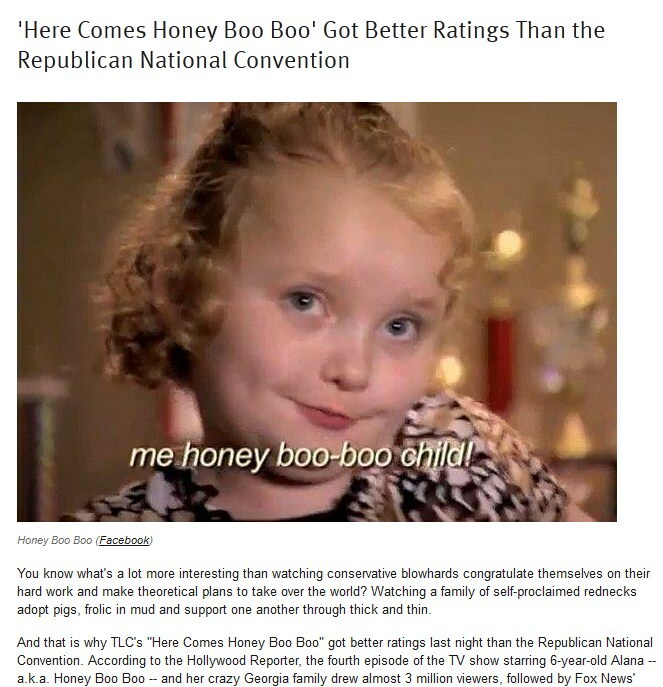 Why did FOX News use an August 25, 2006 report to explain what happened? 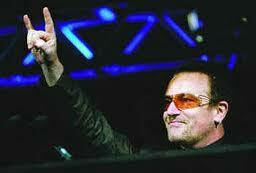 On that night, a large number of reports came in stating that “something came down” rather than blew up. Reports of a loud boom, shaking, rattling and possible damage came in from all over the area, including Barskdale Air Force Base. A spokesperson from the base made it clear that the explosion did not originate there. Reports also poured into the National Weather Service office in Shreveport who “didn’t have any idea what it was." Webster Parish sheriff's department entertained the possibility it could have been a meteorite, and even though they were uncertain what the boom and shaking might have been, “they found no evidence of an explosion.” Sheriff Gary Sexton said they didn’t know what it was or where it hit, but thermal-imaging cameras showed nothing. The USGS reported no earthquakes in the area at the time. Then, NASA and the US Air Force were asked to investigate. If the boom and shaking was caused by an exploding meteor, why were NASA and the US Air Force called in to investigate? But wait – the plot thickens. By Tuesday morning, a cover-up had swung into action, and the story changed radically. The meteor morphed into an “underground bunker explosion” that spewed a plume of smoke (unseen by anyone in the area on Monday night) more than 7,000 ft. into the air. A press conference scheduled for Tuesday morning at 9 a.m. was rescheduled to 11 a.m., and then abruptly cancelled at the last moment with no explanation given. Authorities have yet to say what kind of explosives if any were stored in the bunker. As an ever increasing number of flaming fireballs streak into Earth’s atmosphere and strike with a vengeance, NASA's response is to announce a a meteor shower or previously unnoticed asteroid or comet in the vicinity – ooops, we didn’t know it was there until it whizzed past. According to Nancy Lieder of ZetaTalk, NASA often uses meteor showers as an excuse for the fireballs caused by Planet X, with the debris from the tail ascribed to meteor showers. She says NASA may jump in and make claims after a fireball spate, but only in a sad attempt to explain the increase in fireballs screaming across several provinces, states, or countries around the world. Lieder says the incidence of sightings is many multiples of what has historically been experienced, but cannot be denied as millions see them and flood the Internet with photos and videos. So, what really happened in Louisiana on Monday night? Why the radical change in stories? Was the mysterious explosion in Louisiana caused by meteor or munitions? Survival after the predicted poleshift: Where will you live? What will you eat? St. Lawrence Seaway & other "stretch zones" . . . Earth being "ripped apart"
Planet X: Is a public announcement from President Obama imminent? What’s up with that? Perhaps it has to do with a pending public announcement. Do the world’s heads of state know of the presence of Planet X in the solar system? Yes. View slideshow: Planet X: Is a public announcement from President Obama imminent? Have they been advised of a pending public announcement about Planet X? Without a doubt. Why else would so many world leaders abruptly cancel out-of-country meetings during the same period last week? Coincidence? Could a possible public proclamation about the existence of Planet X have been the reason? What has them so nervous about traveling? And, what about the rest of us? Is a public announcement of Planet X in the cards? Let’s hope so. 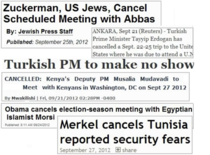 Video: Why so many cancellations by heads of state during the September 24-30 period? The first weekend attempt was September 15-16, 2012. However, due to widespread embassy rioting occurring from the Netherlands to Sydney, Australia, it was postponed. The second weekend attempt of September 22-23, 2012 involved resolving the timing concerns of heads of state and the re-taping of the pre-taped announcement until it was too late to run it. The third weekend attempt was scheduled for September 29-30, the timing of which coincides with an unexpected announcement about major banks being hacked and online accounts being inaccessible. On Saturday, during various attempts to get the message out, the announcement was aborted last minute due to lack of coordination between the major networks and the Emergency Alert System (EAS), which was to be used to get the message out. At 4:30 Central Time, when the EAS was scheduled to broadcast, several individuals watching CNN via different networks heard a beep. At 5:10 Central Time, the time that CNN was supposed to play the tape, CNN’s Wolf Blitzer said "Certainly is a lot going on," and then inexplicably paused, and said nothing for a moment. 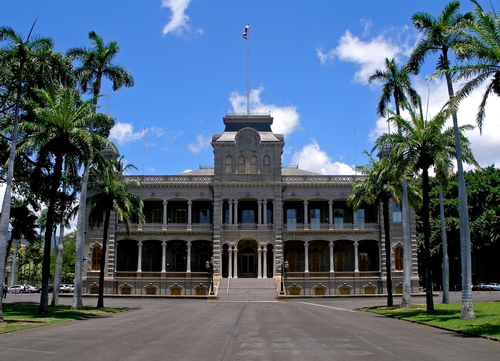 Why so many cancellations by heads of state during the September 24-30 period? President Obama – No appointments listed on the White House schedule (see video); several mock debates with Kerry were cancelled and a meeting with Egyptian Islamist Morsi and a scheduled town hall meeting were also cancelled. Russian President Putin cancelled his visit to an Islamabad summit – in fact, the whole summit was cancelled. Putin's abrupt last-minute cancellation of his own scheduled visit ruffled Pakistan’s feathers. 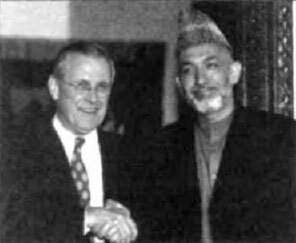 This would have been the first visit to Pakistan by any Soviet or Russian head of state. Confusion surrounds the cancellation. A China-Japan celebration, marking 40 years of the resumption of diplomatic ties with Japan, was cancelled, with reservations for more than 52,000 seats cancelled on Japan–China flights. Turkish Prime Minister Recep Tayyip Erdoğan cancelled a planned visit to New York for the UN General Assembly. German Chancellor Angela Merkel cancelled a visit to Tunisia. Merkel's spokesman Steffen Seibert said the visit was called off by mutual agreement with the government of Tunisia, but he declined to give a reason. Kenya’s Deputy Prime Minister Mudavadi cancelled a meeting in Washington, DC. 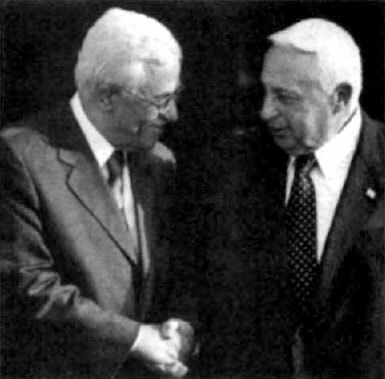 A scheduled meeting of prominent American Jews with Palestinian Chairman Mahmoud Abbas was cancelled. Was the Saturday’s news of “Internet cyberattacks” against such major banks as Bank of America, US Bank, and Wells Fargo, deliberate disinformation? Were the banks notified of a possible “run on the banks,” so that they could be well positioned with extra cash on hand? There were reports of encounters with “nervous tellers” on Saturday when withdrawing cash at the bank counter. Will there be another attempt this weekend at a public announcement of the presence of the approaching Planet X? Let’s hope so. An interesting aside: What’s up with the mysterious tunnels being dug under the White House? NOTE: Now that the heads of state have been informed about the planned announcement, it seems that preparing for an emergency situation and hard times can come more out into the open. In Puerto Rico, a flyer is being circulated by the government announcing a free seminar on October 6 on how to save food so that it will last up to five years, how to prepare a portable toilet, how to filter water, and more. 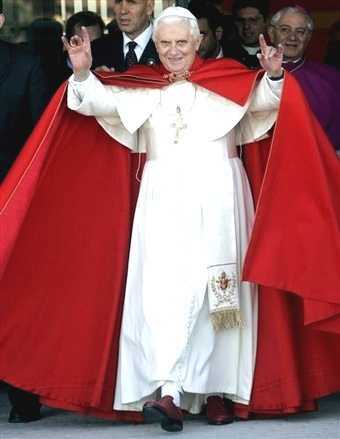 Additionally, the government has advised churches to disseminate information stating that “a big earthquake is coming and people need to get ready.” An earthquake emergency alert test is scheduled for October 18, 2012.
will be the front runner and possibly win the election. dark way. 7-7-12 .... See: http://www.greatdreams.com/blog-2012/dee-blog121. until early 2013, after next year's U.S. presidential election. 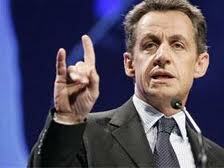 that leg until early 2013, after this fall's presidential election. 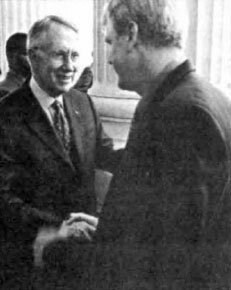 the Republican and Democratic candidates in the 2000 presidential elections. Jul 7, 2012 ... TOPIC: PRESIDENTIAL ELECTION OF 2012. WILL PROJECT ... see: http://www. Jul 13, 2012 ... Dee Finney's blog start date July 20, 2011 today's date July 13, 2012 page 255. 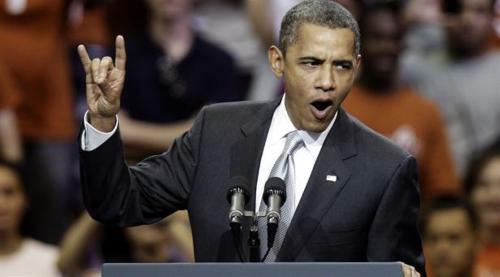 Give him at least until 2012 or 2016 to rack up a host of big accomplishments first. DEE FINNEY'S BLOG INDEX 3. DREAMS OF THE GREAT EARTHCHANGES.